Peter Schweizer wrote a post for Big Peace complaining about United States arms sales under the Obama administration and makes the brief argument that the president is a hypocrite, selling arms to improve the economy instead of protecting our nation and our allies. Nearly 50% of our arms sales go to the Middle East, a region now awash with violence and instability. Schweizer also cites a Mina Kimes article from CNN. Thanks to a surge in overseas demand, the F-15 and other aging U.S. weapons systems are hotter than they've been in years. The Department of Defense last year told Congress of plans to sell up to $103 billion in weapons to overseas buyers, a staggering rise from an average of $13 billion a year between 1995 and 2005, according to Deutsche Bank analyst Myles Walton. Signed agreements have tripled since 2000. First, I think it is interesting to combine figures that take five years from a post-Cold War Democratic administration with five years of a post-September 11th Republican administration as a way to find the average export numbers. Foreign sales by American arms makers actually doubled from 2005 to 2006, and nearly tripled by 2008 (before Obama was elected). Prior to 2001, sales were trending down, with foreign military sales reaching its lowest in nearly 50 years. Also, during the Bush administration, bans on arms sales were lifted for India, Pakistan, Tajikistan, Serbia and Montenegro, Armenia and Azerbaijan because these nations were seen by the State Department as being crucial in the war on terrorism. Secondly, Schweizer only picked what he wanted from the Kimes article. While Schweizer attacks the president for shunnning diplomacy in favor of arms sales, Kimes indicates in her article that arms sales are a big part of diplomacy - the Bush administration was also fond of using arms for diplomacy, rewarding allies with lucrative deals. Schweizer also seems to imply that the Obama administration is helping contribute to the chaos around the world, such as the recent uprisings in the Middle East, but what he fails to consider in his post is the global arms market. 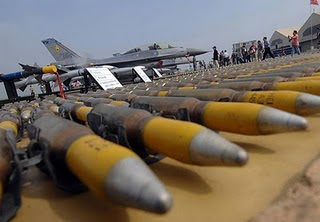 In 2006, after America, Russia was second in arms sales to the developing world, selling weapons to "enemies" of America such as Venezuela and Iran. Schweizer specifically mentions a $4 billion aircraft deal with Saudi Arabia. If America did not sell weapons to other foreign nations to counter-balance Russian sales (or sales by any other nation), then how would the balance of power look in the Middle East? With an equipped militarized Iran and weak nieghbors, the safety of American allies, like Israel, would become questionable. Basically, either Schweizer is misinformed or he intends to misinform. He focuses on one aspect - current arms sales - and ignores the other contibuting factors, such as maintaining diplomatic relationships or stabilizing geographic regions that are prone to unrest. Being that Schweizer is writing for Big Peace, he seems to ignore the peace-keeping aspects of arms sales - allowing soveriegn nations to police their own borders.